Montmorency Falls are located at the mouth of the Montmorency River in southern Quebec province, Canada. It is named by Samuel de Champlain, founder of Quebec after Henri II, duc de Montmorency, who served as the viceroy of New France in the 1620s. He never saw these falls and died never having set foot in Canada. This waterfall measures 83 meters which makes it the tallest in the province and the eighth highest in Canada. It is 30 meters higher than Niagara Falls. It is made up of three separate waterfalls. The Grand Sault is the largest of all three of them. Montmorency Falls make a spectacular plunge into the St. Lawrence River. There is also a suspension bridge that sits atop of its crest. You can get a majestic panoramic view from here. The mist emerging from the falls freezes in winter. It accumulates on the cliffs and at the foot of falls which is known as sugar loaf. During the winter season, it can grow as high as 30 meters attracting a huge number of ice climbers. There are many ways to see the falls. It has various observation points and picnic spots as well. In 1993, a staircase was built by the waterfall which goes from its base to across its crest. You can stand o­n the grounds of the Parc de la Chute-Montmorency and look up or take the cable car to the top. The waterfall was first noted by Jean Fonteneau ditAlfonse during the 1542 expedition of Sieur de Roberval. Now, this waterfall acts as a hub for outdoor activity in all seasons. Declan, Tobin. " 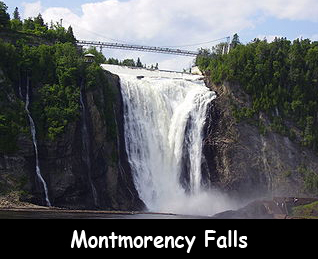 Montmorency Falls Facts for Kids ." Easy Science for Kids, Apr 2019. Web. 23 Apr 2019. < https://easyscienceforkids.com/montmorency-falls/ >.